GEMACO Township Alley Playing Cards (Seconds) are made of specially formulated PVC plastic. Stylish and durable, these cards feature the exact snap, shuffle, and feel of GEMACO Classic "Five Star" Playing Cards. Each two-deck set features color-coordinated, matching card backs. 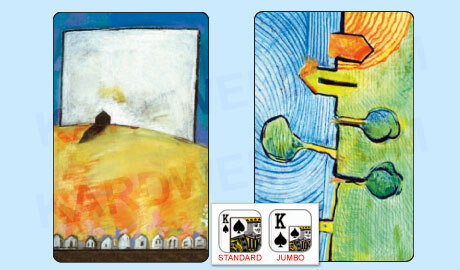 GEMACO Township Alley Playing Cards (Seconds) are narrow size (2-1/4" x 3-1/2") and available in regular or jumbo index (with large numbers and pips). Sale Price: $8.64. Retail Price: $29.50. Save 71%!